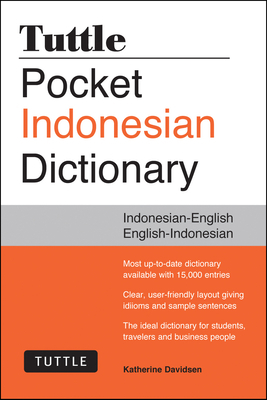 Users requiring a quick and handy reference work for Indonesian, particularly when they are out and about, need look no further than the Tuttle Pocket Indonesian Dictionary. This dictionary has been specially designed for foreigners working or traveling in Indonesia. It is equally useful for Indonesians who live abroad or in an English-speaking environment. No knowledge of Indonesian grammar or word formation is necessary to use this helpful dictionary--simply look up the word as you hear or read it, and you'll quickly find it's meaning. This is a revolutionary feature that most other Indonesian dictionaries are lacking. Covers the 15,000 most common Indonesian and English words. A small, compact size makes it portable and lightweight. Both Indonesian-English and English-Indonesian sections. Special emphasis is given to words vital in daily use, important in business and cultural settings, and useful to travelers. The entries in both sections contain common idioms and expressions, as well as up-to-date IT and Internet vocabulary. There are no other authoritative pocket dictionaries of Indonesian. The Oxford Starter's Indonesian-English Dictionary and the Tuttle Concise Indonesian Dictionary are larger dictionaries with more entries, but these are aimed at students rather than general users.